This is one of those amazing opportunities that the Internet occasionally offers. 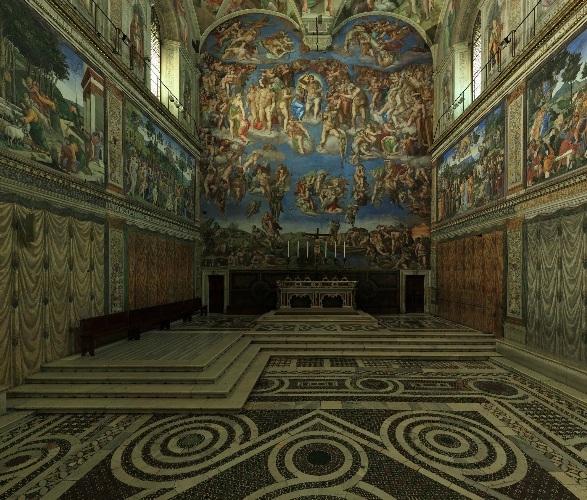 The Vatican Museum (Musei Vaticani) has created a panorama of the Sistine Chapel. Be sure to turn on your speakers, too. There is a beautiful choir singing hymns a capella. This panorama allows you look up at the ceiling or look closely at the walls. You can zoom in and out and twirl about. In short this panorama allows to do things that would not be possible or would at least be frowned upon if you were to do them inside the real building. Zoom in on the chapel ceiling frescoes by Michelangelo or the other frescoes by Botticelli, Perugino and Pinturicchio. Michelangelo began the ceiling frescoes in 1508 and they were unveiled in 1512. Botticelli painted three fresco panels: The Temptation of Christ, The Trials of Moses, and The Punishment of Korah, Dathan and Abiram. Perugino completed several frescoes in the chapel between 1481 and 1482, however only his Giving of the Keys to St. Peter survives. Two of the frescoes that are credited to Pinturicchio are the Baptism of Jesus and Moses journeying to Egypt. Irving Stone wrote a fictional account of the struggles between Pope Julius II and Michelangelo as he worked to paint the Sistine Chapel ceiling. The book is titled The Agony and the Ecstasy. In 1965, this book was made into film of the same name, starring Charlton Heston as Michelangelo and Rex Harrison as Pope Julius II. 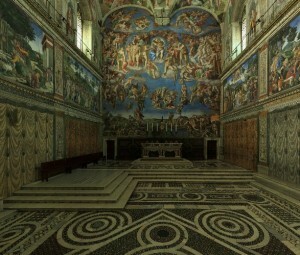 For more information about, or images of, the Sistine Chapel visit the Vatican Museums website. This entry was posted in History and tagged Botticelli, Michelangelo, panorama, Perugino, Pinturicchio, Sistine Chapel. Bookmark the permalink.